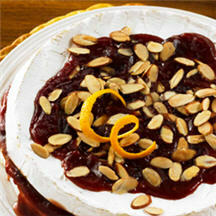 This elegant brie appetizer couldn't be easier and is sure to impress your guests. Combine cranberry sauce, chili sauce, and sweetened dried cranberries in medium saucepan. Cook over medium heat, whisking occasionally, until smooth. Using warm, sharp knife, cut 1 wheel of cheese in half horizontally. Place bottom half on ovensafe serving plate. Spread 1/3 cup cranberry sauce mixture on cheese on plate. Top with remaining half of cheese, pressing lightly. Repeat with remaining wheel of cheese and 1/3 cup cranberry sauce mixture. Bake for 10 to 12 minutes or until cheese is softened. Spoon remaining cranberry sauce mixture over cheese. Sprinkle with almonds, if using.